Nastrificio Victor is specialized in knitted tapes manufacturing. It began in 1945 as a small, family-run weaving workshop; the first customers were mostly tailors and haberdashers. Under the leadership of the founder, Vittorio Rossi Luciani, the company soon began to diversify in order to satisfy the requirements of an increasingly competitive and ever changing market. Victor also produces bows, ribbons, cords, customized tapes, trims and finishings. About thirty years ago the leadership of the company passed into the hands of Vittorio’s daughter-in-law, Regina Bertipaglia, who continues to run the company with a mixture of charisma and creativity to this day. Under the new manager, Victor rose to become a preferred partner for major textiles manufacturers, both in Italy and overseas. On-time delivery, the ability to manufacture in small batches and a unique style represent the company’s main strengths. All products are Oeko-Tex ® Class 1 certified, which means they are suitable for use on maternity clothes and baby items. 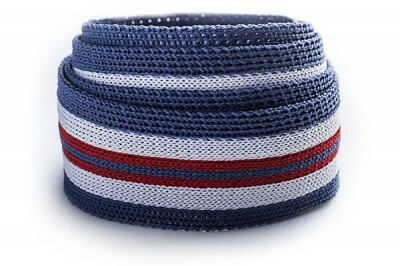 The knitted bands are produced in cotton, polyester and polyamide nylon yarns. The stretch version is made of elastomer. Contact us for more information about our knitted tapes manufacturing.